For the month of May I thought it would be fun to join in a Brit Mums Snap Happy photo challenge and every day there is a different prompt and all you have to do is post your picture on twitter. This was me at the laptop with my new photo mug of Bubba which is very cute. This morning I had actually just booked a Spa weekend for myself and a couple of friends. Very excited. A blast from the past, this is me and my school friends, we all looked big hair and 80's style. Oh I feel old now!!! The one thing that gets me through, Coffee. 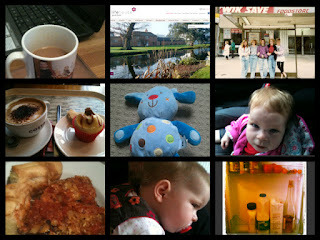 I'm slightly addicted to Costa coffee (and had to try their new raspberry ripple cupcake). Always going to be Bubba. She is definitely the best part of me. Wine, milk and pickles. Only the essentials!! !